I've ordered a few of the vinyl figures. In pics they basically like the Ultraman Ultra Hero 500 Spark Dolls. About 5"-6" tall with a waist that rotates and the arms move. Just simple vinyl representations of the Kamen Riders. Now the auctions on ebay are pretty awful,..most of them have no information and just a pic, they don't say anything about the size of the toy or anything. So I've been trying to learn what series is what size and all that stuff like I did with Godzilla and Ultraman vinyl toys. But for some reason I can barely find any information about Kamen Rider vinyl. There's a ton of stuff on SH Figurarts,..so I guess everyone is collecting those, but I can't find any info on Rider vinyl. No databases or lists of all the figures made. I can't find anything useful on the Bandai website either. it's not 100% complete because the line has gone through a couple name changes. And even there eBay will screw you if you're not paying attention,...like the Ultra Hero series and the Ultra Hero 500 series look exactly the same in pics,..but they're different sizes. Anyway if anyone has some info, or a link to a database,..or just a couple suggestions I'd be grateful. Because with some digging it wasn't too hard to find all the Godzilla vinyl info I needed, and same with Ultraman,..and I enjoy collecting both of those. But now I'm trying to get into collecting the Riders too and it's turning out to be a lot harder to find information. I found the Legend Rider Series and that's about all the info I've found, and I ordered a few of those basically as a test to see if they look the same size as my Ultraman figures when they get here. Last edited by KaijuUltraFan; 11-04-2017 at 02:39 PM..
Kamen Rider Legend Series... that's that new line of Vinyl figures that started around the same time as Build's toyline right? I wasn't sure if I wanted to pick them up since I'm not a fan of the taller vinyl figures Toei does but if they're the same size as the Spark Dolls I might actually get them. is it a new line? I'm having a hard time finding info on them. I think they're around 5"-6" tall. I'm hoping they're the same size as the Spark Dolls/Ultra Hero 500's. when they get here, (I went nuts and ordered 8 of them) I'll take some pics of them with my Ultra Hero 500 figures. maybe them being a new thing is why I can't find info on them. 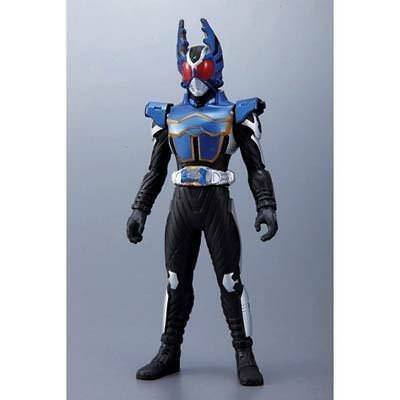 I ordered V1, V2, V3, Amazon, Kuuga, Agito, W/Double, and OOO's. Kuuga I have doubts on because the auction didn't say 'Rider Legends' but it looked like a vinyl figure with the tag and card attached just like my Ultra Hero 500 figures. But one arm looked bent in a pose and not straight, maybe it's a different vinyl line. It's why I wish I could find more info on Kamen Rider vinyl, the different lines and sizes. I really like the Spark Doll/Ultra Hero 500 size. Not too big, not too small. ...I wish I had found that blue Gattack figure like in my first post! That guy looks really cool. The Rider Hero Series is, afaik, around 17-18 cm tall or thereabouts. So I think they're taller than the Spark Dolls. As far as a database of them goes, I don't know how complete it really is, but MFC's seems like a good place to start. The Build RHS releases are all in the same style as these LRH ones. As far as buying things, I can't really be too sure since I don't look at these too much, but Mandarake would probably be a good place to look. It often is, for most things. thank you. I'll bookmark that page. I guess if they end up being 6-7 inches that isn't too much bigger than the Ultra Hero 500/Spark Dolls (which I'm pretty sure are 5 inches), it's not the end of the world, they wont completely dwarf and tower over them. Vinyl must not be as popular as the SH figures because I find tons of reviews and info on them. They do look great so I understand why they'd be popular. But it makes it hard to sift though trying to find reviews and sizes and comparisons of vinyl. There's just something about vinyl I like though so that's what I tend to focus on. Thanks again, I'll watch the video now. is this the Rider Hero series compared to the Legend Rider series? And the Legend Riders are only half painted? look at around 5:30,...the Decade figure is only half painted. And the W/Double figure is missing details, and the black line going down his center. I guess Rider Hero are the nicer figures? Even though the sculpts look the same it's like they're half-painted. I think recent RHS releases just feature less paint apps than their earlier counterparts. The comparison of the Den-O in the video I posted also shows that the old one had a more detailed paint job. It's not that RHS is a higher quality line, and more that the standards for the line have changed over time. The paint certainly has suffered. yeah it looks like the same figure just one is fully painted and one is half painted. You can see some details in the front are missing. The belts aren't as detailed. W/Double is missing some paint in the gold section of his Cyclone side and the black center line is gone,..little things but still noticeable. 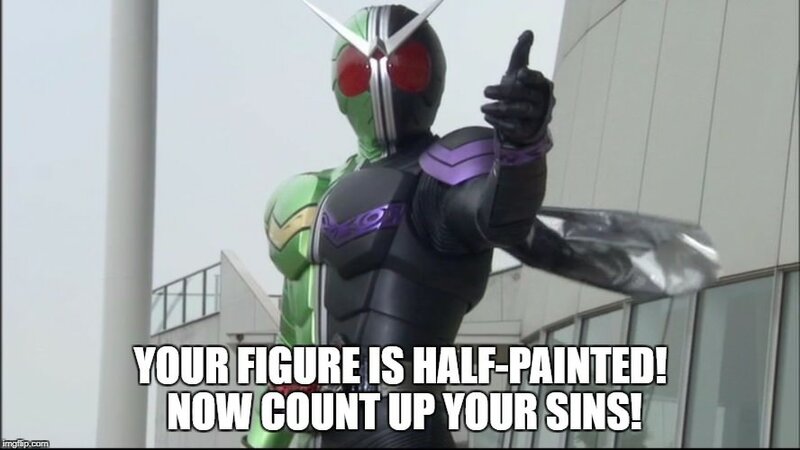 Decade though really seems half-painted. I got 8 of them then switched to getting the SHF line. I like the vinyl figures though, I just wish they were painted more.